Are you someone who shops with reusable bags? Back in 2010, I started moving to my family using reusable bags, especially after reading more research on how plastic bags were hurting the environment. Before then, we weren’t really in a position to afford spending the money on bags, but it felt like the right thing to do, especially when I was shopping more at stores that didn’t provide their own bags or boxes. My biggest problem with reusable bags, however, was that they were huge, bulky, and very difficult to bring in stores, unless I wanted to fill my ENTIRE cart with bags. While I recently found other bags that don’t take up so much space, it is still difficult to organize and bag things in the grocery store, especially with Kroger now moving to a scan and go system as you shop. 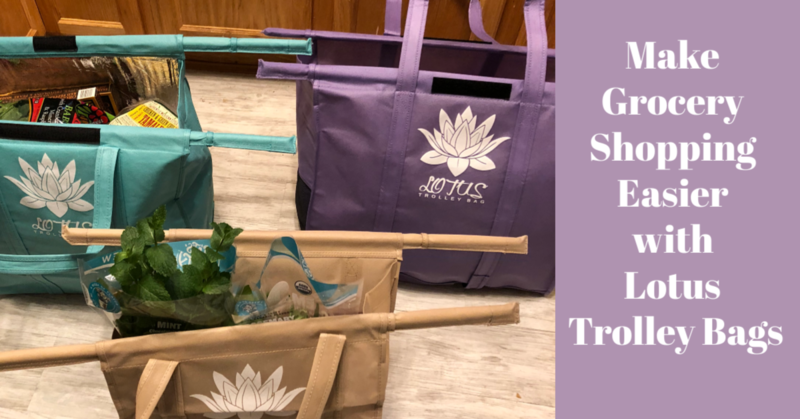 Luckily, I recently found the perfect solution for not only having reusable bags, but a full system to organize my groceries too – the Lotus Trolley Bag System! Lotus Trolley Bag System: What Are They? Want to learn more? Make sure to watch the video below! 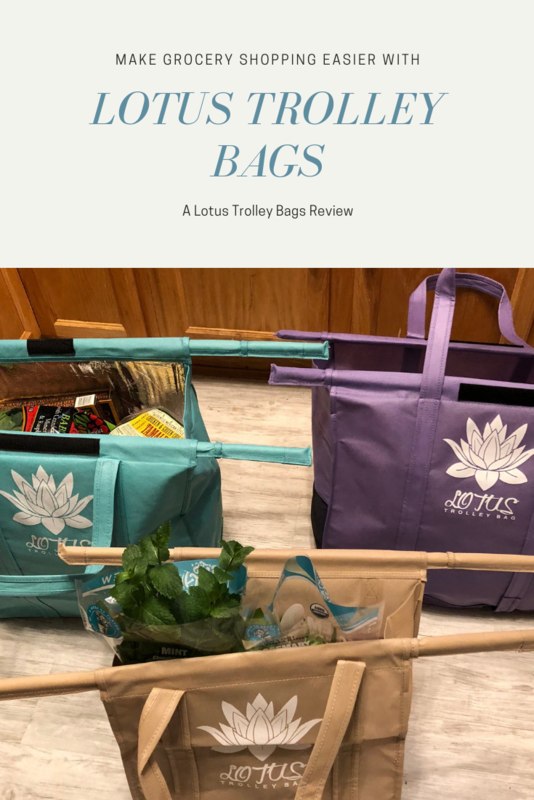 As someone who loves using reusable bags, I couldn’t wait to try out the Lotus Trolley Bag System. While the bags seemed a bit bulky due to the rods, this is also what made them so very practical. Carrying them from the car seemed a bit odd with the width of the rods, but they fit perfectly in just about any normal cart. All you had to do was have the rods balancing on each side of the cart, and filled them as needed. We tested these multi-purpose bags at Sam’s Club and Trader Joe’s. What I found was that the bags were extremely easy to use, mobile, and seemed never-ending in size. While they seem somewhat small at first glance, they are absolutely huge when loaded! I also never had a concern of them falling apart due to weight with the double-reinforced stitching. Best of all, was the very large cooler bag. It was roughly the size of a standard club bag, but far more practical, allowing us to fit so many freezer and refrigerated items in the bag. I also loved the wine and egg pockets in each of the bags, helping keep various, delicate items safe as we go. 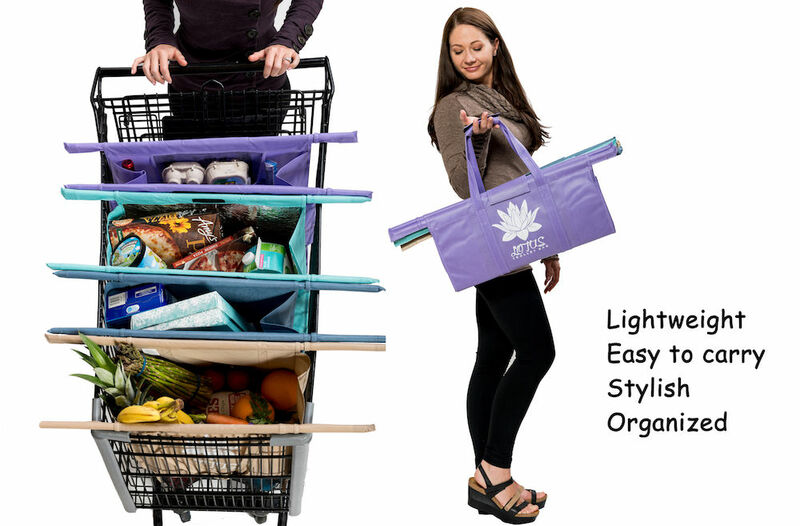 Honestly, after trying them out for the weekend, I am planning on tossing (or donating) the majority of my reusable bags since the Lotus Trolley Bag System are just so much more practical and useful! The only issue we had was the wider cart size at Sam’s Club – while they hold things very well there, the rods were just not quite long enough to get both sides of a Club cart. They work perfectly at Trader Joe’s, and would definitely fit most normal grocery carts, as advertised. Lotus Trolley Bag System: Where to Purchase? Want to purchase these awesome bags for yourself or someone you know? You can find the Lotus Trolley Bag System on their website here. They are also launching a Kickstarter, starting soon, for their new product bags and club cart bags (learn more about them here). I use an inefficient hodge-podge of bags. Wow, I never thought of getting a nice set of bags, but this has me twirling so exciting. I must check this out! It looks like these bags would save a lot of time and hassle. Thanks for posting! Great looking bags these are and I love how strong they are made for shopping, One thing is really sticking out to me is that I love the fact that I can put this bag in my carriage and its not going to fall down in the carriage. These are amazing! I am thinking of getting some for my daughter for a gift! This is kind of genius. But how much room do they take up (with the cross poll/braces) when not in use? What a perfect solution! I have tons of recycleable bags all over the house and they take up room in the car trunk. My mom could use a set too! This is a good idea. The bags are so attractive too. These are really nice shopping bags.I like how you can organize while you shop! That really looks convenient. I especially like that it has an insulated bag. I have never seen these bags until now. They would make my shopping so much easier.